Embedded computers are all-in-one devices that handle special purpose computing tasks for both consumer and industrial applications. Mainly x86 & RISC based hardware, it supports standard Windows operating system and Linux, CE & XPE platform. A user friendly design platform is also available to facilitate application development. 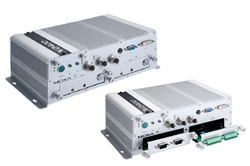 All our embedded computers come with MOXA integrated Rcore, a ready-to-run embedded software platform that shrinks the system development process and reduces development efforts.